Mediterranean Turkey (Akdeniz Bölgesi) is a region in Turkey. It occupies entire southern coast of Turkey and some places more inland. Pamphylia — mainly a mass tourism destination, this is the shining gem of the Turkish Riviera with some of the clearest waters and longest sandy beaches along the Mediterranean; there are more than a few things to catch the glimpse of history lovers, too. 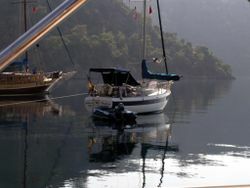 Marmaris — a nice town, albeit touristy, and the gateway for "Blue Voyage"
Mediterranean coast of Turkey is mostly a narrow strip of land squeezed in between pine-covered Taurus Mountains (Toros) and the Mediterranean Sea. Having been spared from pollution thanks to the lack of heavy industry, lying under one of the sunniest skies of Europe, together with its rich art and history, make the region the top tourism destination in the country. Home to a number of ancient civilizations, namely Lycia, Pamphylia, and Cilicia west to east, Mediterranean Turkey was captured by the Romans about a century before the birth of Christ. After a brief occupation by the Crusaders on their way to Jerusalem, as evidenced by a number of Crusader-built or -expanded citadels mainly on the eastern sections of the region, and a number of Crusader-backed Armenian kingdoms, Turkic Seljuqs seized the region. It was during this era when the ancestors of most of the region's locals poured in from Central Asia as nomadic tribes. Some still keep the tradition to this day, wintering on the warm coast and heading for heights of Taurus Mountains or plateaus of Central Anatolia more inland to the north when summer approaches with their goat and sheep herds. Seljuqs were later replaced by Ottomans in around 1400s. As expected, Mediterranean Turkey enjoys the typical Mediterranean climate: the temperature can go above 40°C in rainless—and even cloudless—summers, while the rest of the year is quite rainy, although winter lows rarely go below +5°C and snowfall is virtually unknown in the region (except the tops of the quite high mountains close to the coastal strip, of course). The season with the highest amount of rainfall is winter (more or less limited to late October through early April in this region) and can be accompanied by strong winds, to the point of storms, in the localities close to the shore, especially around Antalya. Water temperature of the Mediterranean Sea is around 28°C during summer, i.e. May through October. Inland Lakes District has an altogether different continental climate than the rest of the region, and the winters can be severe and quite snowy there. The region is home to a plethora of Turkish dialects, from Muğla şivesi, some of which is totally incomprehensible for non-local Turks spoken in Lycia to the dialect of Cilician Mountains, which is essentially a mainland "extension" of Cypriot Turkish. Syrian dialect of Arabic is also prevalent around Antakya. However, thanks to heavy tourism, English will likely be enough to communicate during your trip, especially in the western parts of the region (i.e. Pamphylia and Lycia) and especially if you don't intend to go off the beaten path. German, Russian, and Scandinavian languages may also be helpful, especially when you visit one of the resort towns mainly frequented by those nations. By plane — major airports in the region open for international flights are located in Dalaman, Antalya, and Adana. By train — Adana has daily direct passenger train services from both Istanbul and Ankara (and a number of other cities on the way, such as Konya), while Isparta and Burdur has services from Izmir. There is also a once-weekly connection between Mersin, and Adana and Aleppo in Syria. By bus — All cities and a good number of towns, especially those with touristical importance, have direct bus connections from all big cities of the country. By private taxi — You can reach also to [[antalya provinceAntalya taxi]] province by private taxi service in turkey with affordable prices. By car — The region is connected to the northern parts of the country by a number of highways, though passes that the roads have to go through when running over Taurus Mountains mean that the roads may have more windings and be narrower than usual motorways. However, O-21 north of Adana/Mersin, is an exception as it is a wide motorway with separated directions. By boat — There are ferries from Northern Cyprus to a number of coastal towns. See also Ferries in the Mediterranean. Buses (for long-haul routes such as Antalya to Adana) and minibuses (for shorter routes between a major city and nearby towns) will be your main mode of transportation within the region. 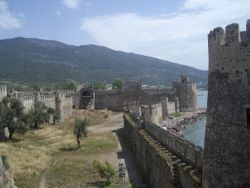 Services are fairly frequent and quite comfortable, and especially so in more touristed areas of Lycia and Pamphylia. Train service in the region is limited to Cilician Plains with a branch line south to Iskenderun in Hatay. Lakes District also has a (nowadays mostly unused) line stretching out to northwest. There is no long-haul ferry route along the coast, however, round boat trips offer pleasant cruises into remoter parts of the coastline from major touristy towns. There are no flights between region's airports. The highway D400, which closely follows the shoreline of Turkish Mediterranean from one end to another, is the main road of the region. While most of it is very wide (at least 2 lanes per direction) and in a very good condition, some sections are very winding and narrow such as the section between Alanya and Silifke. There are other roads, such as D650, which connects more inland regions (Lakes District) with the D400, thus the coastline. Ruins — The region is dotted by many ancient city ruins. Most date back to indigenous civilizations of the region, which were expanded or rebuilt by Romans later. Citadels — Being on the strategic main route between Europe and Middle East, there are also lots of citadels in the region, either surrounding the cities or in a valley or on a rocky hill to defend the nearby roads from unwanted guests. Many, especially those in the eastern portions of the region, are either built by Crusaders from scratch or heavily fortified. 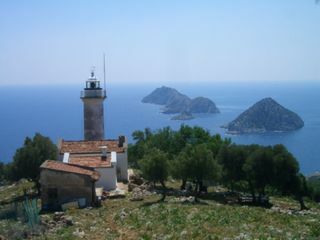 Lycian Way — A 509-km, waymarked hiking trail connecting Fethiye with the southern suburbs of Antalya. Yachting. One of the top cruising areas in the Mediterranean basin, southwestern reaches of Mediterranean Turkey (coasts of Lycia and western Pamphylia) offers abundant yachting options. In the much famed and hardly overestimated Blue Cruise (a.k.a. Blue Voyage; Mavi Yolculuk), started by a group of Turkish intellectuals in 1940s and usually compared to cruising in Caribbean, you take a chartered gulet type yacht (two-masted wooden boats) for a pre-specified amount of time (usually 15 days), and cruise from cove to cove with turquoise waters surrounded by pine-covered mountains suddenly rising at the edge of the sea, calling at coastal towns and fishing villages on the way. Marmaris, Fethiye, Kaş, and Bodrum and Kuşadası (the last two of which are in Aegean Region) are usual starting points of a Blue Cruise, although voyages extending all the way from Izmir to Antalya are not unheard of. While local cuisine traditionally embraces goat meat, which is less common to the much of the rest of the country and may lead to stomach trouble to who are unaccustomed to it, restaurants in touristy towns frequently feature more familiar treats. Fish restaurants abound in seaside towns, while typical Turkish fast food döner and the like is common in bigger towns and cities. Adana in the east is known for its own style of kebabs (Adana kebabı), while cuisine of Antakya to southeast, being culturally a part of neighbouring Syria, features highly delicious and partially vegetarian (or even vegan)-friendly Middle Eastern fare. A great way to reduce your bottled water costs in this hot region is to use free cold water dispensers, locally called sebil (pronounced say-beel), which can usually be found on the sides of the streets and mosque courtyards in less-touristed towns and neighbourhoods in the region. They look like small, white refrigators and usually have two faucets: red one delivers warm (or mildly hot depending on the weather) water, while the blue one offers comfortably cold water. Though the water coming out of the faucets is not from a commercially-bottled jar, and likely from the city water network, it's harmless and causes no stomach upsets. A way to reduce the risk may be allowing yourself a week after arrival in the region to get accustomed to local microflora and -fauna that may be present in the water and then taking full advantage of sebils. Mediterranean Turkey lies on a more southern latitude than anywhere else in Europe except Cyprus and the Greek island of Crete, so take it easy in the beginning of your trip and pay close attention to early signs of heat stroke and dehydration. While on the beach, applying liberal amounts of sun lotion wouldn't hurt. If you plan to spend time in the mountains, be wary of scorpions. They thrive in Mediterranean climate and rocky areas are their habitats, so never reach under a rock without carefully checking first. Keeping your backpack closed at all times will keep them out, and don't forget to check the inside of your shoes first, should you take them out for any amount of time. On crowded public beaches (i.e., those that aren't owned and enclosed by a resort hotel), don't leave your valuables like cell phones and cameras unattended, or better yet, don't take them to the beach. While many beaches are patrolled by the police and security cameras, there are still reports of petty theft. Otherwise, Mediterranean towns are very safe (and security forces very keen to keep them so), although there may be rough areas in large cities such as Antalya, Mersin, and Adana. Aegean Region to the north/northwest has a lot in common with Mediterranean Turkey (especially the climate, landscape, and flora), yet has unique aspects that make it a separate region. Northern Cyprus is a short ferry hop away to the south. Most travellers intending to get deep into Middle East to the southeast of region cross to Syria from one of the border gates around Antakya. If the Seljuq sites in Alanya and Antalya aroused your interest, head north to Central Anatolia for a lot more. Southeastern Anatolia to east is quite an off the beaten path destination and is an altogether different world.